I offered to make a pud for a family barbecue recently then remembered that to enable everyone to enjoy it it needed to be gluten and dairy free. Panicking in the supermarket I picked up a pineapple! Obviously, although tasty, on it's own chunked pineapple does not make a particularly elegant dessert but luckily I had an idea of how to adapt a pudding I tasted at a blogger conference when I was a keynote speaker there a few years ago when a chef from a major supermarket was knocking out taster dishes. 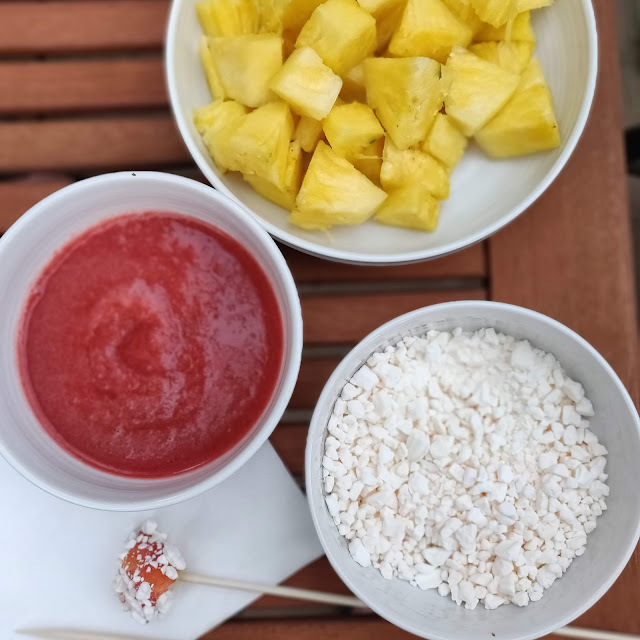 Basically it was cubed pineapple which you dipped into a red fruit coulis and then into crushed biscuits. I ate so much pineapple that day my mouth hurt! I've wanted to try and recreate it for years but looking at the price of gluten free biscuits, decided to substitute crushed meringue instead. I picked up a punnet of "imperfect" strawberries from Tesco (just 90p a box), a pack of wooden skewers and a box of 8 ready made meringues. Yes I could have made them but I had chosen to spend the previous evening drinking wine in my friend's garden instead of preparing BBQ desserts so speed was of the essence. Luckily the coulis takes minutes to make so while the strawberries were bubbling in water, sugar and vanilla, me and my hangover topped and tailed the pineapple, quartered it and took out the hard centre and cut the skin off. Meanwhile my daughter happily bashed four of the meringue nests in a ziplock food bag until they were coarse crumbs. I whizzed the coulis mix with a hand-held blender and put it in a airtight plastic tub, put my pineapple into another tub and threw the bag of crushed meringue into the cool bag with them to transport to Hampshire. 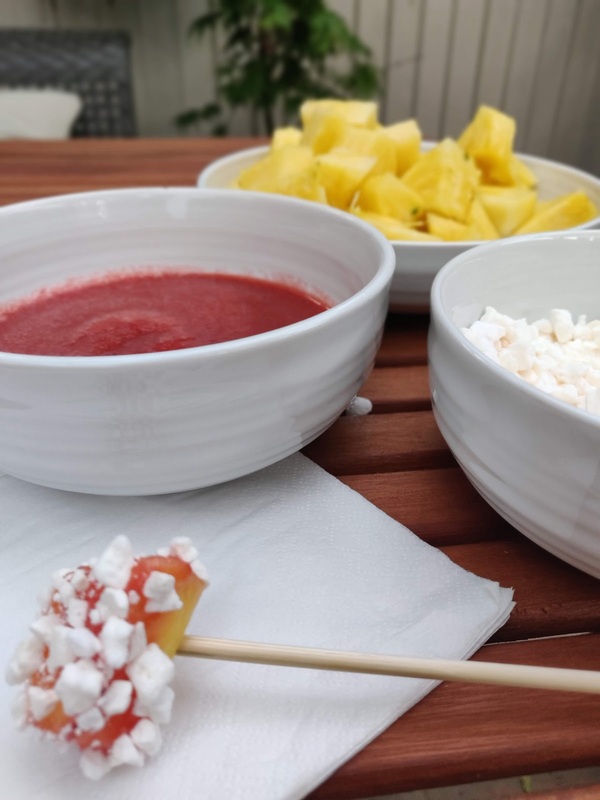 The dessert proved to be very refreshing in the blistering temperatures we had that day and so I bought another pineapple and punnet of strawberries and used the leftover meringue to make another batch for another barbecue the next day where it proved equally popular. Here's the full coulis recipe in case you want to make this dish yourself. 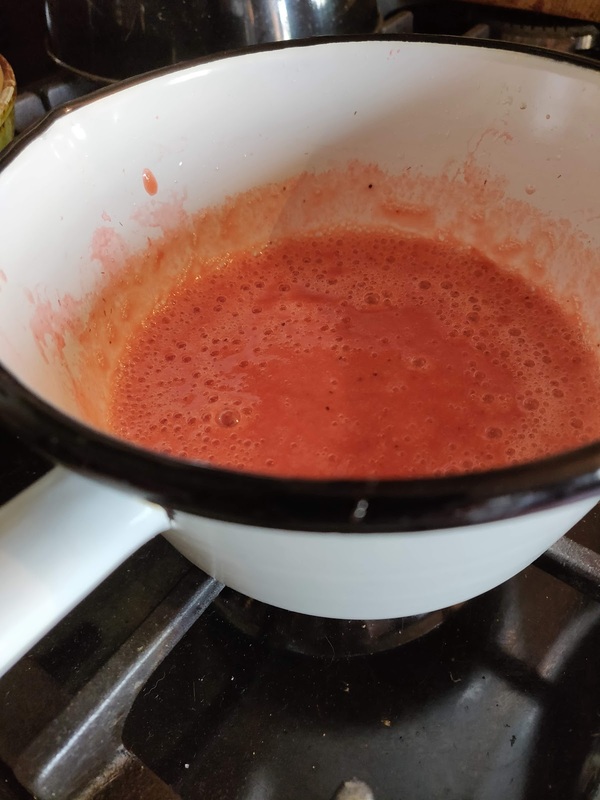 Bring water and sugar to the boil in a saucepan then add trimmed strawberries and vanilla. Simmer for 4-5 minutes. Strain through a sieve or whiz with hand held blender or small food processor until smooth.